In the now-legendary days of the mid-1990s, a trio of enthusiastic young comic book artists banded together to form a creative alliance the likes of which had not been seen before or since. The young artists were named Bruce Lewis, Tim Eldred, and John Ott. Their alliance was called Studio Go, and they were delighted to spend two years and a few months of their lives bringing you the Star Blazers comic book series from Argo Press, a division of Voyager Entertainment, Inc. This series was long overdue, graciously received by Star Blazers fans, and thoroughly enjoyed until it finally succumbed to the fickle whims of the American comic book market and could no longer be profitably published. We all mourn its loss, but now it belongs to the ages. Anyway, this article and those that will follow over the next few months aren’t about the comic book or the trio that produced it. Instead, it’s a look at one of the more interesting side-effects of this venture. Because the Star Blazers comic book series consisted of both adapted stories and original stories, it was decided that a detailed and integrated history should be written that would take into account all the places, people, and major events that culminate in the Star Blazers saga. A non-human intelligence evolved on a distant world. In time, this Elder Race devised the means to manipulate matter at its most basic scale, that of pure spirit, and rebuilt its homeworld (called Akwaar) into a travelling worldship in order to search the Universe for other intelligent life. These beings entered our local group of galaxies and began to spread throughout the milky way and its satellites. 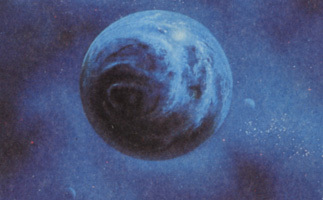 Twin worldships were created and moved into orbit around the star Sanzar to serve as a new home for the Elder Race: Iscandaa, a world of light and life intended as a place of celebration and joy, and Desraa, a stark planet of groundquakes and emptiness intended as a place of solitary contemplation and purgatory. 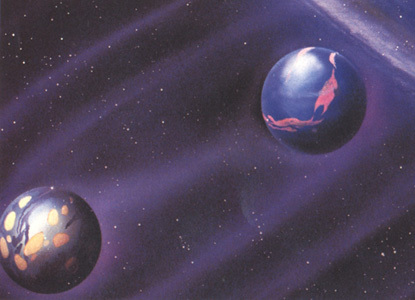 Equal and opposite, these two artificial planets were placed into orbit around each other as a titanic symbol of the Elder Race and its dedication to the principle of Balance in the Universe. Exploration groups were established on seven additional worldships, including the flagship Akwaar, and an intensive search for life in the local group of galaxies began. The worldship Akwaar discovered a cooling planet near a G-type yellow star on the Galactic Rim. Noting conditions there, the decision was made to “seed” the planet in hopes of bringing forth a new species of life there. Complex molecules were introduced to the primordial seas of this new world. The life that evolved from them would carry the spiritual essence of the Elder Race within itself. The new race would eventually become the human race, and they would call the planet Earth. During the intervening centuries, life of Earth evolved (with help from the Elder Race) into the first human species. Meanwhile, the Elder Race evolved past the need for matter and into pure Spirit itself, incorporating its collective consciousness into the essence of each of the worldships, leaving behind their advanced technology in subsurface caverns. Each guarded by its own Spirit, the worldships were parked into orbits around sun-like stars in preparation for the next phase of the Elder Race’s plan. The Elder Race that became the Spirit of Akwaar decided that the new human race was its fitting spiritual heir and decided to spread humanity throughout space. To this end, human colonies were planted on each of the eight remaining worldships, which became known as “daughter worlds.” These colonies in time grew into the Eight Daughter Races of the Universe: the Iscandaa, the Telezaa, the Galman, the Bolaa, the Shalbaa, the Bimeraa, the Lugaru, and the Deziliaa. The Ninth Race, the Aquariaa, was the Human Race itself, which was left on its world of origin. Akwaar was placed into a hyperdimensional “orbit” that would take it into and out of the Universe once every 10,000 years. The Daughter Races across the galaxy grew and progressed. The first race to achieve starflight was the Iscandaa, who now called themselves the Iscandarians. The Iscandarians created a “spiritual science” based on both physical research and the principle of “love for all life.” Based on ancient legends of an advanced “elder race,” they conducted research into the nature of physical reality. 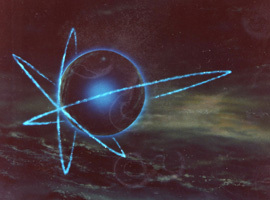 This research lead to the discovery of Wave-Motion physics, and of a Warp engine based around the element Iscandarium, of which their planet was in large part composed. Using the Wave-Motion engine, the Iscandarians sent out great ships of crystal and copper and explored the galaxies, eventually visiting each of the Daughter Worlds in turn and exchanging people and knowledge with them. Using Wave-Motion technology, Iscandar was remade into a paradise world. The other Daughter Races soon began their own progrms of exploration and colonization. Meanwhile, on Earth, the blue-skinned Denguil Empire arose in Mesopotamia. This was a time of extreme drought, and the Denguils developed an aggressive warrior culture in order to survive. Their “Sky God” religion centered on prayers for life-giving rain. At this time, the worldship Akwaar reappeared in Earth’s skies, and this time the Spirit of Aquarius decided to improve humanity by subjecting it to a severe test. Akwaar was moved near to Earth, and resulting floods were interpreted by the superstitious Denguil as punishment for impiety. By coincidence, a spacecraft from Lugaru (now known as Lugal) was investigating the Solar System when this occurred. Tutored by the altruistic Iscandarians, the soft-hearted Lugal accepted the entire Denguil population as refugees and saved them from the flood. Akwaar (now known as Aquarius, or the Water-Bearer) disappeared, leaving the rest of Earthbound humanity to survive the disaster as best it could. A few tribes did, and the experience lead to the familiar Flood story in ancient legends. Humanity had passed its first test. The population of Denguil within the Lugal Empire continued to grow. The aggressive, territorial Denguil adopted the technology of their savior race and used it to create their own sphere of power. Finally, civil war broke out as the Dezahl Dynasty of Lugal was overthrown by the Denguil warlord Uruku. Uruku crowned himself as Lugal Dezahl I and established a new Denguil Empire. Over the next few centuries, the new, aggressive philosophy of Denguil came into conflict with the peace-loving ideals of Iscandarian culture. Soon, battle-lines were drawn. Forming the so-called “Yang Alliance” on the side of Denguil were the Bolaa (now called the Bolar) and Deziliaa (Dezarium) Empires. Forming the equal and opposite “Yin Federation” on the side of Iscandar were the Telezaa (now called Telezart) and Shalbaa (Shalbart) Empires. The agricultural Galmans and insectoid Bimerans (or Bee People) remained neutral as a 20-year Galactic Civil War began. The hive-dwelling Bimerans established a haven on a little-known planet between galaxies. The Galman Exodus fled from Dezarium genocide to establish a new home on Iscandar. The destruction was immense, but eventually the war ended. The Yin Federation managed to beat back the Yang Alliance, reducing the Denguil to a primitive existance on Lugal itself. The Bolar were simply forced to retreat to a solar system in the Galactic Core region, although their original homeworld was lost. 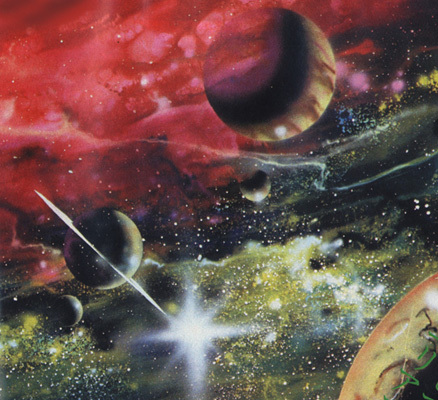 The Dezarians, who had attempted to exterminate the “inferior” Galmans during the war, were sentenced to banishment, their homeworld warp-shifted into an empty, neighboring universe called the “Galaxy of Light.” Guarded by a huge, gaseous nebula, the interdimensional pathway between our universe and the lonely Dezarians’ remained an impassible barrier for five millennia. In the years after the war, the “Inward Turning” began. Sickened by the killing and cruelty which they had practiced during the war, the victorious Yin civilizations based on Iscandarian culture withdrew from galactic civilization and concentrated on spritual cleansing. The many colony worlds established by them drifted away from their motherworlds and began to forget their origins. Spaceflight fell into disuse as the Iscandarians and their allies began to explore “inner space.” An exception to this rule was the Galman colony on Iscandar. The vigorous, agrarian Galmans, disgusted by what they saw as a cowardly retreat from reality on the part of Iscandarian culture, seceded from Iscandar and established their own unique civilization on Iscandar’s twin planet Desraa, renaming it New Galman. The final phase of the Iscandarian “Inward Turning” began as the inhabitants of that world destroyed their spacecraft and became a race of pastoral philosophers and craftsmen. Cut off from trade with Iscandar, the colony on New Galman was forced to adopt harsh measures in order to survive on their unstable planet. Gang warfare broke out as groups competed for scarce water and other resources. A centuries-long period of warfare began as the gangs became tribes. Over time, the Galmans forgot their galactic origins and came to call themselves by a new name: the Gamilons. The Telezart retained a small local presence in their solar system, with some space travel and a leisure-based civilization based on antimatter-powered technology, but were gradually reduced to a pre-industrial existence. On Earth, recorded history began. 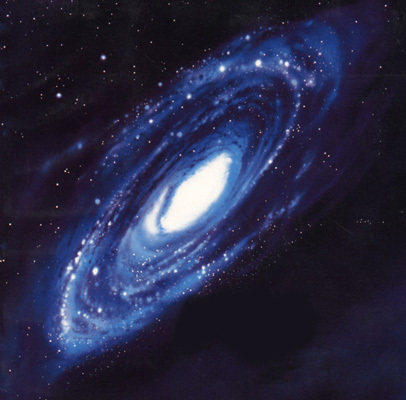 The size of the universe guarantees that there is other life out there. Unfortunately, it also guarantees that we’re never going to meet them.